China plays the most important external role in Africa’s infrastructure construction, as the largest contracting nation in Africa. Europe used to be Africa’s largest contractor, accounting for 44.3% of the region’s total market revenue in 2002, but its share declined to 34.6% in 2011. 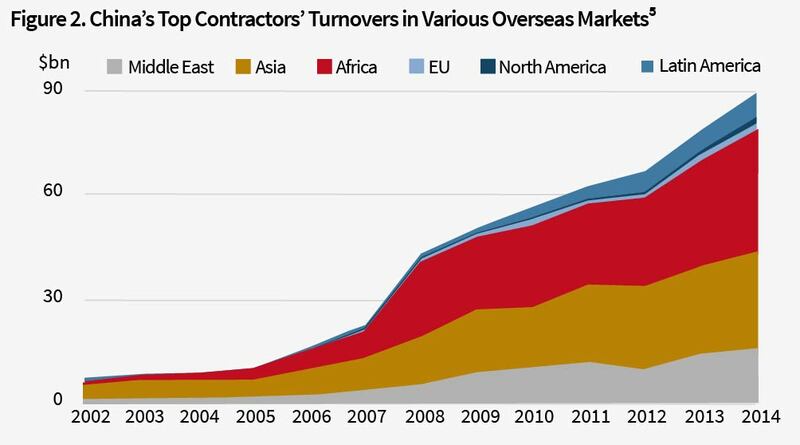 The market share of US contractors dropped even more, from 24.1% in 2002 to 6.7% in 2011. In contrast, the market share of Chinese companies rose sharply from 9.9% in 2002 to 40.1% in 2011, and has remained fairly stable2 (see Figure 1 below). The data in Figure 2 refer to the projects commissioned to Chinese SOEs by customers in the African countries, usually their national governments. When it comes to the financing of African infrastructure, China’s involvement is quite different. 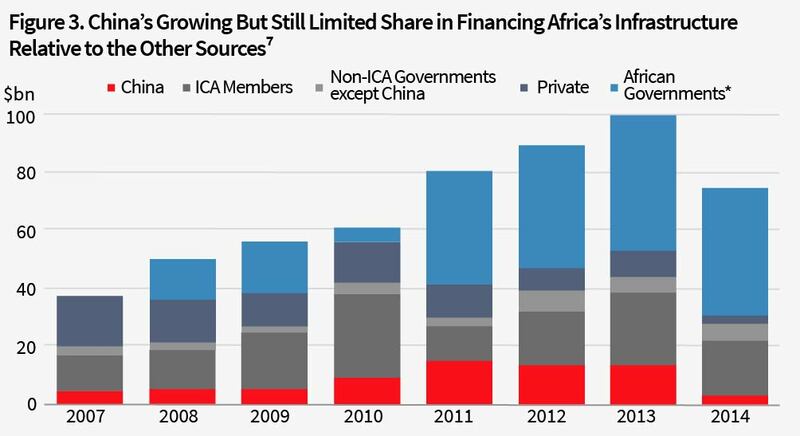 While China is the largest funder of African infrastructure as a national government,6 its financing is more limited than other funding sources (see Figure 3 below), especially in comparison with its dominant role in project contracting and construction. It is important to distinguish the roles and responsibilities of Chinese entities in financing vs. building Africa’s infrastructure projects that carry varied short- and long-term benefits and risks. There are two distinctive dimensions to Chinese entities building in Africa. The China-funding aspect refers to the projects where Chinese entities, usually the EximBank, occasionally the SOEs themselves, play a major role in funding the projects. They could potentially become a shareholder in such projects, which are not necessarily built by Chinese contractors, although the latter are involved in most cases. Second, the China-contracted projects are those that are built by Chinese enterprises, mostly SOEs, but not necessarily funded by the Chinese government. The data above reveal the different levels of China’s involvement in contracting and financing African infrastructure development. It is clear that China is more of a contractor and builder than a financier. 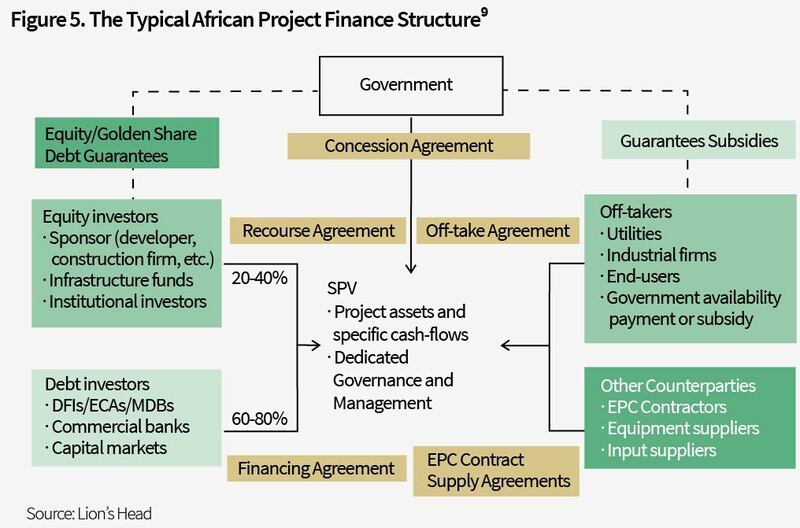 Whilst China is building the majority of infrastructure projects in Africa, the financing of these projects often comes from sources other than Chinese banks, and companies themselves (see Figure 4 below). 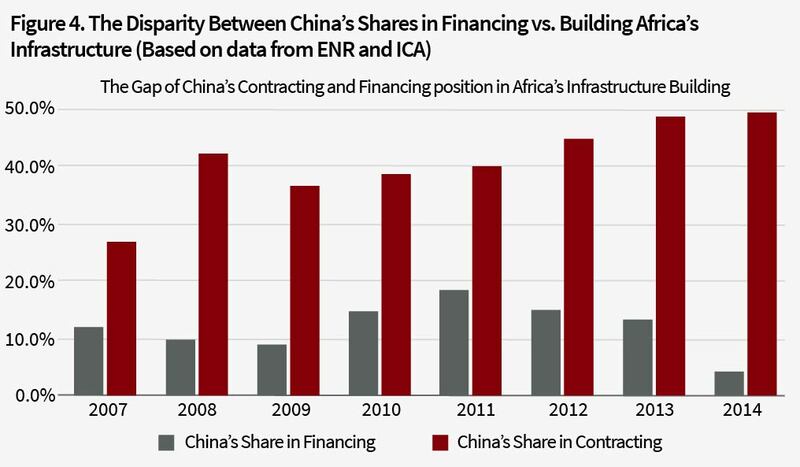 In revealing the disparity between China’s financing and building roles in Africa’s infrastructure, we highlight a complex environment in which many Chinese SOEs are limited to a marginal position, even though they are the contractors and builders of most infrastructure projects. This environment features multiple sources of financing that both facilitate and inhibit China’s extensive presence and influence in Africa’s infrastructure sector. As suggested by the most recent ICA report (2014),8 the largest investment in infrastructure in Africa comes from the African governments themselves. Normally this is enhanced by external financial sources, the largest being ICA funding, that mainly include the OECD countries and regional banks such as the World Bank and African Development Bank (AfDB). A typical financing structure and flow is illustrated in Figure 5. Given the Chinese enterprises’ state-owned nature, they are likely to be seen as more politically oriented. In principle, Chinese SOEs have been ‘modernised’ since the Company Law was passed in 1993, and are supposed to follow international corporative practices, through the separation of ownership and control. In reality, the central government continues to influence SOEs mainly through two mechanisms: the de facto shareholder of State Assets Supervision and Administration Commission (SASAC) and the Personnel Appointment System.12 For the subsidiaries of SOEs operating in Africa, decision-making is naturally decentralised and largely localised, which limits the leverage of SASAC. The subsidiaries in Africa are not very popular among their mother SOEs’ employees. This leads to a short-term human resources management system. Junior managers would normally work in an overseas subsidiary for 2-4 years, before being transferred back to China. The relatively short assignment makes them focus on near-term targets, such as maximising the number of contracts signed and the turnover of projects, which are regarded as benchmarks for their promotion and subsequent transfers, while the long-term benefits and sustainability of projects are neglected or even sacrificed. Besides this term-based personnel system, there is a lack of long-term strategies from the Chinese government or the SOEs to exert any positive social impact through these infrastructure projects. This is also why the Chinese SOEs are usually observed as being segregated from the African cities and places where they operate. The capacity of Chinese contractors’ communication with locals is lacking partly due to the labour management system in Africa. Most of the SOE employees in Africa are manual workers. In 2011, China sent 452,000 workers abroad, of which 243,000 were engaged in construction work, accounting for 53.8% of the total.13 This has created some misunderstanding, distrust and even antagonism from the host countries. To be fair, on most construction sites in Africa, the majority of the labour force turns out to be local. But since infrastructure construction is labour-intensive and there is a chronic shortage of skilled labour in the local market, it is not surprising that a large number of construction workers are sent from China. According to a recent study by Ethics Institute of South Africa, 55% of the interviewees had the impression that Chinese companies in Africa were hiring Chinese employees only. This is neither true nor practical. As reported by China Daily in 2011, at China Roads and Bridges Corporation (CRBC), the ratio of Chinese to local employees was around 1 to 15, with our caveat that this may not be representative of most China-built infrastructure projects. The Chinese government has a policy of encouraging all SOEs to “Go Out” to Africa. While this policy may or may not be politically motivated, Chinese SOEs face serious challenges in following this policy, let alone being able to fulfill any political agenda behind the policy. The entry of many SOEs into Africa’s infrastructure sector creates severe competition among themselves, often leading to price wars and underhanded or shady practices. As revealed by a senate debate in Kenya, during a bid for C13 highway construction, of the ten companies who submitted their bids, five were from China. Not surprisingly, the lowest price offer came from one of the five Chinese companies, Jiangxi International Ltd, which was a well-established enterprise in East Africa and also building a few important projects in Nairobi. To be more specific, while the officially estimated cost for the project was 5.2 billion Kenyan shilling (ca. $64 million), the bids from the Chinese competitors were 3.8 by Jiangxi International, 4.5 by China Wu Yi, 4.5 by China Railway No. 5 Engineering Group, 4.8 by Shengli Engineering 4.8 and 5.0 by Sino Hydro. In comparison, a local construction firm with equivalent size and experience quoted 5.2 billion and Hayer Bishan Singh & Sons, an Indian company, offered 6.0.15 This is not rare in Africa. In a recent bid for an infrastructure project in Angola, there were 13 Chinese companies out of 21 bidders. Generally speaking, there is lack of a strategic plan for many Chinese contractors to act as truly market actors in the distant and unfamiliar African market. While the increasingly competitive and saturated domestic infrastructure market in China pushes more SOE builders to go to Africa, many of them failed to develop a long-term strategy to take advantage of the market potential in Africa. Although Chinese SOEs have not developed a very effective long-term strategy for Africa’s infrastructure market, the Chinese government found it critical to grow and diversify financing in Africa. Its main financing channels include grants, zero or low interest loans, and preferential export credits.16 Among them, the concessional loans and preferential export credits are the two main tools used by China EximBank, and called “the Two Preferential Loan Programs” (Liangyou). Figure 6 (see figure 6 below) captures these practices through a triangular structure of the agencies from the Chinese and African sides and their basic procedural and operative interrelations. Compared to a more detailed scheme developed by Deborah Brautigam,17 our diagram left out several procedural steps associated with government regulations. More importantly, the diagram shows that the three actors have independent interests and functions in implementing infrastructure projects, and that each has the ability to initiate a project and its financial flow between the three parties. This way of visualising a triangular structure aims to dispel the illusion that the Chinese government agencies and policy banks (MOFCOM and the EximBank) always team up with Chinese SOEs in dealing with their counterpart – the African governments and their agencies. While the bilateral agreements between the Chinese and African governments are the foundation for financing any project, they do not directly lead to roads and bridges being built. 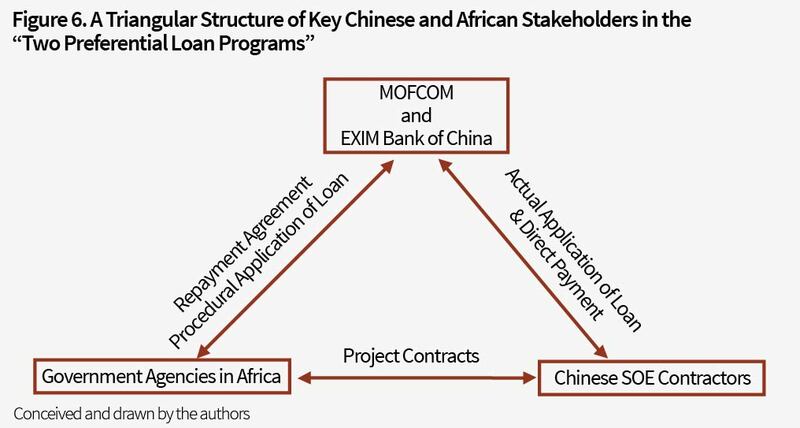 In practice, African agencies can and may reach out to a Chinese company when they are aware of the connection between the company and the EximBank or MOFCOM that could ease the access to the Two Preferential Loan Programs. On the other hand, Chinese SOEs, when bidding for projects in Africa, can use the government financing support to enhance their competitiveness against non-Chinese bidders. One important drawback built into this framework is a lack of third party evaluation and supervision of the financial flow between the three parties. In financing from sources such as the World Bank or JICA (Japanese International Cooperation Agency), a private or independent consultant team would be hired to assess and monitor the projects’ financial flow. In the China-African Triangle, the feasibility study usually is conducted by the SOE that has won and will build the project, supported by Chinese diplomatic officers in the embassies, evaluated by permanent employees of the Bank,18 which usually leads to reporting that discounts risks. Another issue with this way of financing and building infrastructure is the unfair and irrational concentration of risks. Once a loan is initiated, the SOE building the project receives regular payments directly from the EximBank, which lowers the risk of no profit for the contractor. It also shifts the risk to be shared between the African Government and the EximBank. Considering that most of the infrastructure loans from the EximBank offer a grace period of 5-10 years, the burden for a borrowing African government is significantly reduced. Since the electoral system in most democratic countries in Africa is a 3-4 year term, it is fair to say that the government in power would rather seize the financial resource for now than being concerned about who will pay back the principle plus interest down the road. As a result, the risks for potentially unpaid or defaulted loans end up in the hands of the EximBank. This explains why MOFCOM had to limit the budget in funding Africa’s infrastructure to around 3% of the bank’s profile,19 which might also account for the drop of total investment from China to African infrastructure in 2014 (see Figure 3). The discussion above points to the fundamental loophole of the EximBank’s financing model for African infrastructure: it’s not sustainable. The repayment of the loans largely depends on external elements, or lies in the hands of the local agencies. Even if the Chinese government has any political ambition with the loan as the vehicle for projecting soft power, the other two players in the triangle are much more short-termed and opportunistic, which forestalls or limits the adoption of a strategic and sustainable approach to infrastructure provision. As long as this triangular system dominates the financing from the Chinese government for Africa’s infrastructure, the benefits from the projects for all parties will be limited overall and unevenly distributed. When it comes to inter-governmental financial support for African infrastructure, or in terms of the ODA (Official Development Assistance) methodology, the Japanese model can be used as a comparison. 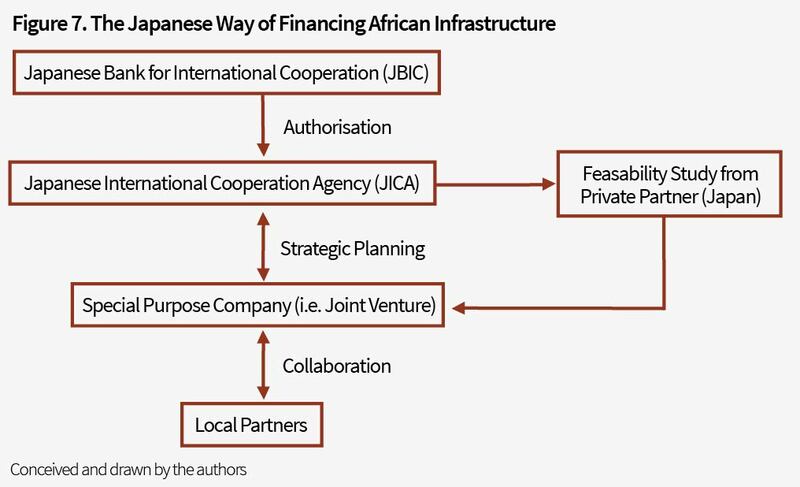 China used Japan’s aid system as a model in developing its own foreign aid policies in the 1970s.20 But the Japanese model for financing African infrastructure today (see Figure 7 below) stands as an alternative to the Chinese approach. The JBIC, the equivalent of the EximBank, does not enforce any ODA loans by itself. Instead, the semi-government agency JICA (Japanese International Cooperation Agency), authorised by JBIC and the central government, is in charge of financing projects in Africa. By establishing a Special Purpose Company, often times taking the form of a joint venture with a local partner, JICA would implement strategic planning at the project level. As an effort to strengthen public-private partnerships, JICA would initiate a call for bids from private partners in Japan to carry out a feasibility study. The winner will then follow the project implementation as an important stakeholder. The hierarchical structure reflects a strong enforcement of the Japanese government decisions. In addition, if we place both the Chinese and the Japanese models into the framework shown in Figure 5, the Japanese entities would be located on the left side of the diagram and maintain a long-term interest in a given project, while Chinese SOEs would remain on the right hand side in pursuit of short-term profits. Despite contributing a much smaller amount of investment to Africa’s infrastructure development than China, Japan “has adeptly walked the fine line between assistance and interference, … staffed by technical experts or the Japanese Overseas Cooperation Volunteers, which is loosely analogous to the US Peace Corps. Practicing the softest of soft power, Japan became one of the largest but least visible donors to Africa.”21 In Kenya alone, the bypasses in Nairobi and a highway in Kisumu were designed and funded by JICA. JICA also sent two expats to Nairobi’s city council to carry out long-term research and the metropolitan plan of Nairobi, the most recent and potentially the first implemented urban plan after the 1948 British version for Nairobi. 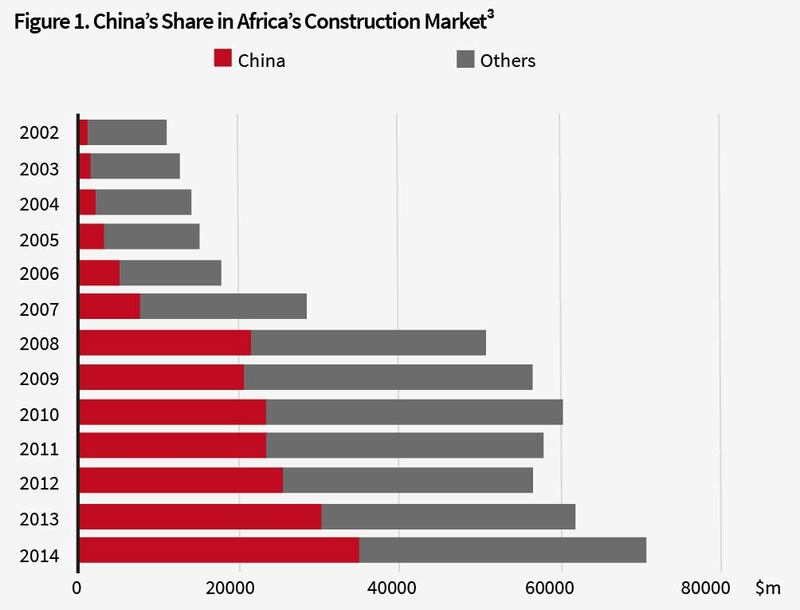 There has been a rapid, sometimes explosive, expansion of Chinese contractors into the African building market. It may look like a large-scale aggressive strategy of the Chinese government to exert political influence in Africa. However, our analysis suggests that Chinese SOEs are mainly profit-driven in pursuing short-term economic goals, which tends to produce a wide-ranging but shallow impact. While China’s policy of encouraging its companies to ‘go global’ has encouraged some SOEs to enter Africa’s infrastructure sector, many have gone in to make quick money using their experience and expertise in building low-cost standard infrastructure and taking advantage of the relatively easy access to financing from international, African, and Chinese lenders. Smaller than other sources of financing and its building role, China’s financing through the EximBank and MOFCOM has allowed SOEs to take some risks and reap decent profits. At the same time, while unwilling to provide more financing fearing the risk of instability in some African political regimes, China’s state lenders have assumed some long-term risks of certain African governments failing to pay back the low-interest loans. In these ways, the Chinese state has blended and blurred with the increasingly market-oriented SOEs. If China’s own development is any guide, physical infrastructure can play an important role in Africa’s economic development. However, it takes a long time to return on investment in transport infrastructure as the lagging demand from faster economic growth catches up to the supply of newly built roads and railways. In a shorter time horizon, African local residents can benefit from the municipal infrastructure projects such as stadiums, schools, hospitals and light rails that China has also built. These immediate benefits for local users however will not last for the long haul if the municipal facilities are not properly operated and maintained. For China, just building them in Africa is not good enough. Whether it is a sign that China has moved beyond just building in Africa, China has agreed to train over 100 operators for the light rail system it has built in Addis Ababa, Ethiopia. In building Africa’s infrastructure, is China signaling that its own development model based on infrastructure-induced industrialisation, which has brought ‘miraculous’ economic growth, could work or be replicated in Africa? If you built it in China, they or the investors did come, in very large numbers. But building infrastructure in Africa faces one fundamentally different constraint. In China, the public ownership of urban land and the aggressive conversion of rural land from communal to public ownership, in conjunction with a powerful developmentally-oriented state, has allowed the government to quickly build massive industrial (factory zones) and transport (roads and railways) infrastructure on huge swathes of land within, around, and between municipal boundaries. In Africa where land ownership is mostly privatised, government is generally weak and economic development is primarily based on an extensive informal sector, it is an entirely different proposition and process to secure large and connected lands on which to build infrastructure. As a result, before we can really assess if and how the constructed infrastructure in Africa will lead to faster economic growth through more industrialisation, we need to figure out if China is building Africa in a way that can be financially stable, socially responsible, environmentally sound, operationally sustainable and bring other equitable benefits for both sides. *Earlier versions of this article were presented at the Eastern Sociological Society annual meeting in Boston, March 17-21, 2016; at the “Governing the Future City” workshop at University College London, London, April 21-23, 2016; and at the Center for Urban and Global Studies at Trinity College, Hartford, April 26, 2016. Helpful comments from these audiences were acknowledged, but we are responsible for any errors in facts and interpretations that might be in this article. We thank the Henry Luce Foundation for an institutional grant that has brought Zhengli Huang to Trinity College as a visiting scholar and facilitated the completion of this article. This article was first published at The European Financial Review. We Canadians can either distance ourselves from the current war mongering and Fiat U.S. Dollar manipulation and find fair economic ground with China and the Global Market Place or be eaten alive by yet another U.S fiat money printing session with “Banks too big to fail” and ‘Quantitative easings’, wars that they/we cannot afford for oil Canada does not need. China is building her own new customers and nation building based of fair trade as we watch the sun set on a barbaric war mongering U.S.A. ?